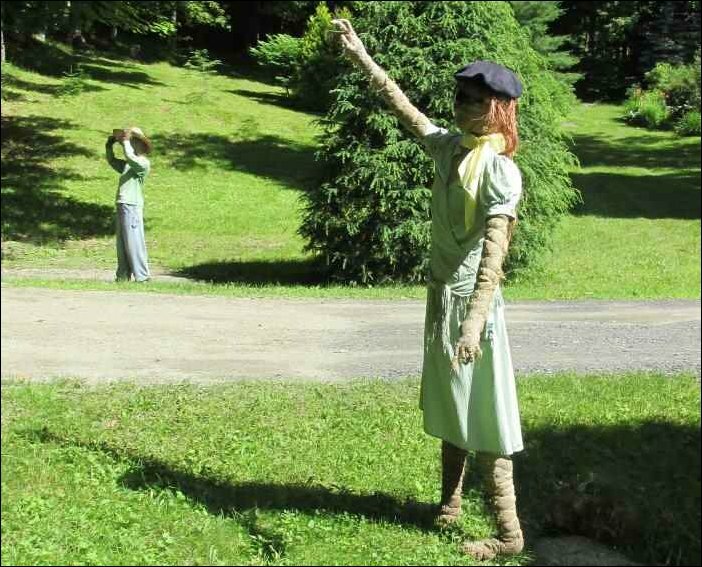 A girl about the age of twelve, sporting a French beret, stands to the side with her face tilted, looking over the fields as I turn my car onto the driveway. She doesn’t move but stands eerily still with only her dress stirring in the breeze. She is one of Michael’s many creations. “Scarecrows” he calls them, but to me, they are depictions of people, complete with sinuous limbs, brought to life through the bending and twisting of straw onto hard, wooden frames. The girl and other “scarecrows” are carefully arranged on the lawn and oversee gardens of vibrant colors and assorted textures. 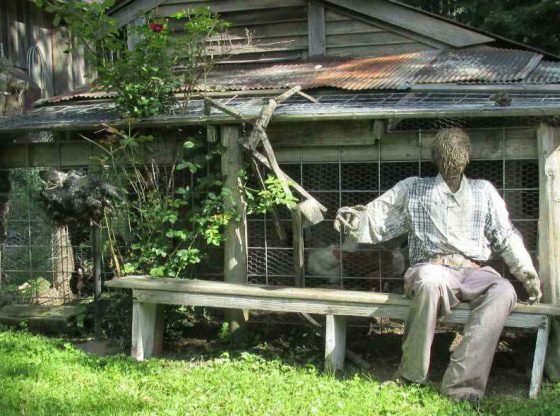 The scarecrows and gardens serve as mere segues into the creative world of Michael and Linda Melle. The Melles took “the long road home” when building their sturdy, two-story colonial house. Resting on a hill surrounded by nine acres of gardens, fields, and woods is a simple home with painted brown clapboards and a metal roof. 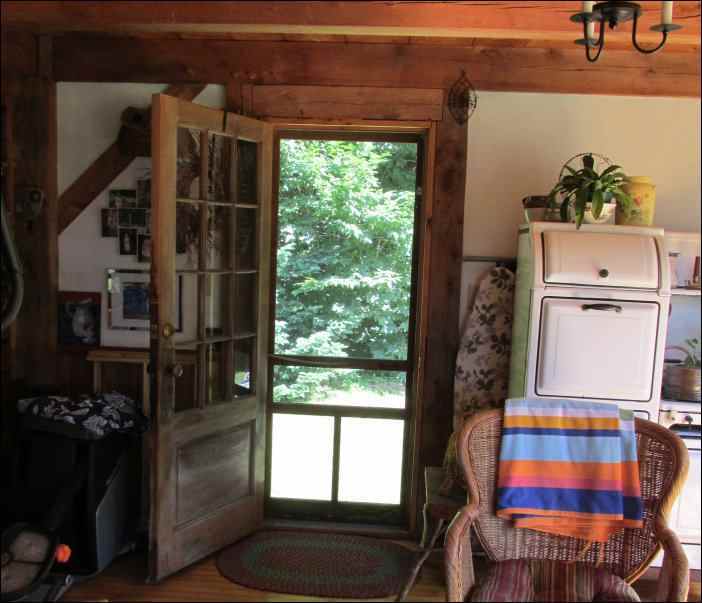 A chicken coop, the residence of vibrant hens providing eggs of different colors, is viewed from the front door. 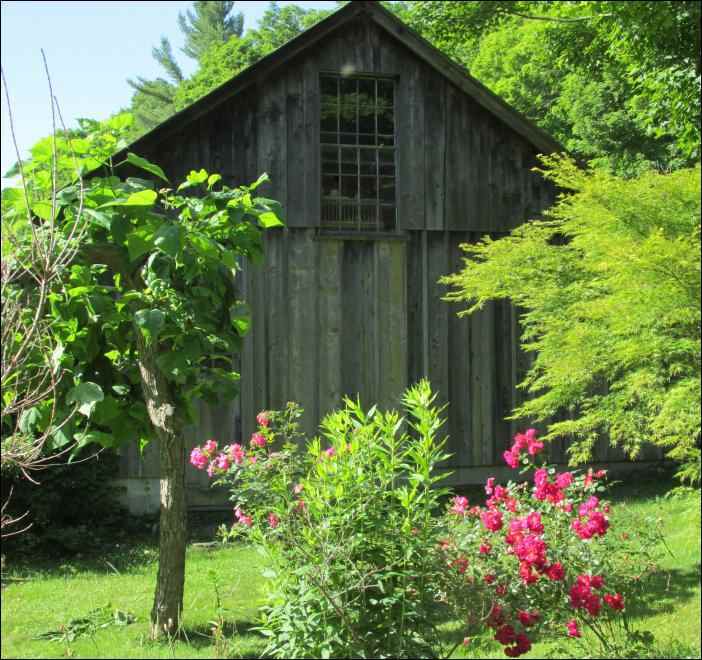 A gray, wooden barn decorated with Michael’s tin art sits alongside the coop. The recent addition of a garden shed with leaded-glass windows is nestled closer to the house. At first glance, the modest appearance of these buildings belies their intricacies and the amazing stories of their birth. The Melles are homesteaders in the truest sense of the word. Like many other trailblazers, they channeled their vision of a place to call home into the labor of innovation. 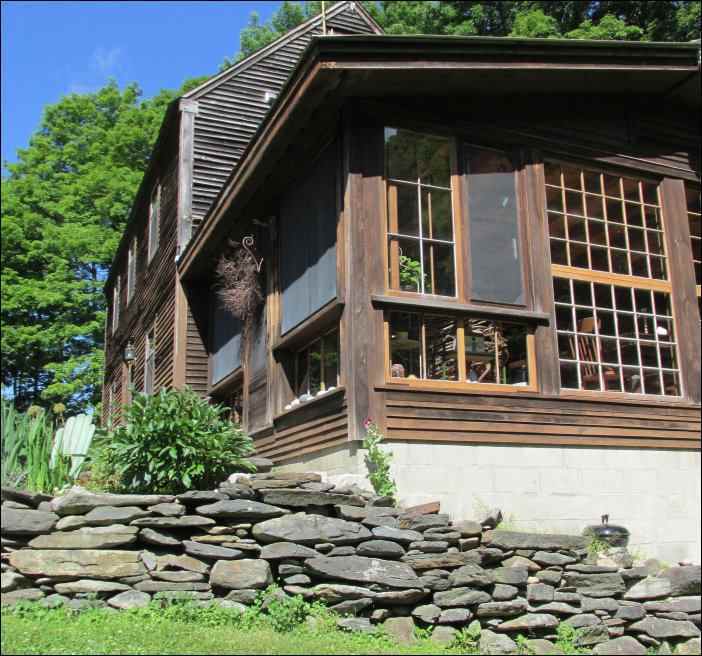 The roofs, rafter boards, and flooring from various Berkshire buildings are integrated into their sanctuary making it a unique paradise. Their discomfort with debt further fueled, and fuels, their creativity. Sitting with Linda and Michael in their spacious three-season room, with soft sunlight pouring through windows of sans glass, I am regaled with stories. I am told the windows are from a friend, having been part of a business deal gone sour. As I listen, my eyes settle upon the warm hues of the braided woolen rugs deepened by the light. The rugs, skillfully designed and crafted by Linda, cover the honey-colored hardwood floors. One would never guess these same floorboards were once trampled by teams of basketball players from area schools. Michael salvaged them from the Pittsfield YMCA’s old basketball court. Many people decide upon a location to live based on access to work and the quality of school systems, but the love of Forbes Library in Northampton, Massachusetts was the deciding factor for the Melles. The building’s architecture and the books contained within made it a warm and welcoming place for those with eager minds; they needed to be within 15 to 20 miles to be given a card. Unable to find the right house in the right area, they decided upon the purchase of nine acres of land in Plainfield, marking the start of their adventures. There’s an art to salvaging materials for use in construction. The laws today, as building inspectors will tell you, are not as permissive as they were in the 1980’s. The Melles describe having a solid working relationship with a building inspector as imperative to a project. This advice is as true today as it was forty years ago. To take apart and remove pieces of Building #2, Michael needed to have a dump permit, insurance, and to set himself up as a commercial business. He christened the business, “Mass Destruction.” The warehouse originally was built from a kit, and its dimensions were 70×30 feet with some fine pieces of siding, timbers, and roof rafters. The salvageable parts resulted in a “new” 30×30-foot barn. A tradition began of preparing food to entice friends and family to help with the muscle work. Frames went up and Building #2 was converted into a spacious dry barn. Linda, Michael, and the children traded in their tent for the comfort of four solid walls with a floor during the weekend pilgrimages to the site of their new home. Transporting materials from their original site to the new homestead wasn’t always easy, and the “original” site was not always the first place where the materials had been used. Michael described loading the roofing and beams of the hangar into his homemade wheel-cart after the airport commissioner gave his blessing. A large gully made it impossible to move his truck closer to the site. After some thought, he added as an aside, “This wasn’t the first use of any of that material.” The airplane hangar’s previous incarnation was that of a factory building. Michael was irritated. He knew the inspector had a metal roof of his own that was “exactly the same.” The Melles’ bank loan was small; the model of “pay as you go” was instilled in him from generations of house builders before him. A supportive board member of the bank interceded, and the roof, as well as the Melles’ loan, remained intact. The collapsing barn had a metal gambrel roof. As with other demolition/salvage projects Michael received permission from the owner and took out the prerequisite insurance before beginning his work. The morning he arrived the roof was damp with dew. Linda appeared frightened as if she was back at the site again, “He almost died.” Fortunately, their harrowing adventures were few and far between. The Melles were still living and breathing the creation of their home eight years after purchasing the land. Michael was a postal worker; he left his workday behind following each shift. The remaining time was spent clearing land, digging the foundation, and gathering resources, with only two of those years spent in active construction. Erik, their youngest child celebrated his seventh birthday shortly after moving into their “new” home. Linda recalled the intensity of raising two small children during the building phase. They had moved from their home in Pittsfield and into her cousin’s house for the next four months. The weekend trips to the land continued with the barn as their base. Michael’s father quietly suggested they purchase a trailer to live directly on their land. Heeding his advice, they bought one from another family who had used it for the same purpose. The town hesitated in allowing the makeshift home, but okayed it if it sat on a permanent foundation. Which it did; the foundation consisted of piers. The luxury of electricity arrived, and with it a working pump and toilet. No more carrying forty pounds of water to their trailer. On a Saturday morning in September of 1988, three years after moving into the trailer, Linda had enough of roughing it. Her son and daughter were sharing a small room in the cramped space, and although they both were young, Linda sensed her daughter, Eliza, needed privacy. Sometimes Eliza would quietly take her sleeping bag and steal away to spend the night on the sawdust-covered plywood floor of her soon to be room. It was time to move. With Michael at work, Linda made her decision for their little family to take up residence in their rough, but new, home. The move surprised him as it presented different challenges for finishing the house. He had to work around his family and their belongings. Today, across the road from Linda and Michael, is a house showing off its new metal roof. The land was purchased by the Melles as a way of securing their retirement and was later sold to their daughter. Eliza and her husband negotiated updated building codes and used newer materials for their home; nonetheless, Michael and Linda contributed their expertise and experience to the young couple. Eliza’s house is newer in every regard, but carries forward the Melle tradition of home building; it is a tradition as old as the mountains of northern Italy. Michael’s great-grandfather came from a long line of masons and constructed his own home of handcrafted, hollow, painted concrete bricks—bricks he fashioned at the end of every day until he had enough to build his house. 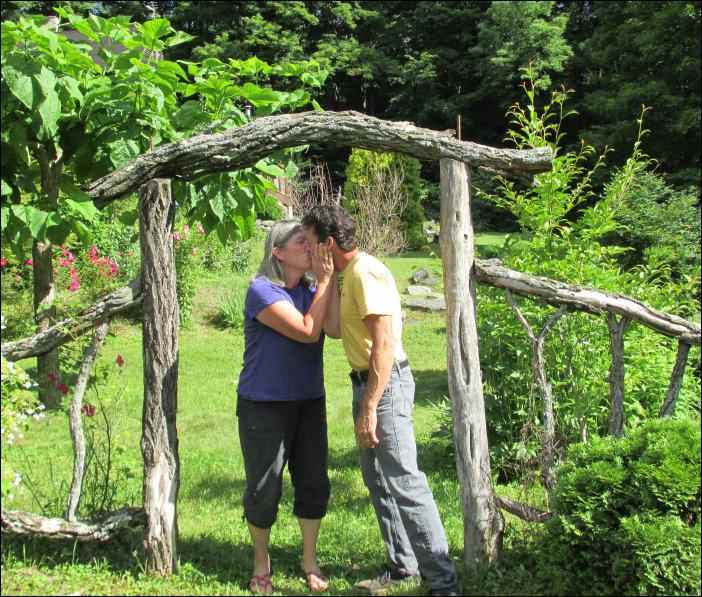 One can only imagine the homes Linda and Michael’s grandchildren may one day create. A wonderful story told with warmth about a truly beautiful couple who worked hard together to build a home, a family and a generous, loving way of life. A beautiful couple who would give you the shirt off their backs. Beautifully landscaped property and immaculate home. A home and family we all aspire to create. Absolutely wonderful people. Beautiful and isnsightful story. You all have lived and are living a life style of our past heritage. I’ve always loved Michaels creativity and Linda’s love of the land with gardening cooking land country living. May God bless all of you. Great article about a most unusual couple. Very inspirational. Great story, beautiful pictures, and a wonderful story about love and commitment. This story captures the grit, the ingenuity, the warmth and the love that went into building not just a home, but a life. A delightful read. Love the photos! A beautifully written story about a beautiful commitment to a way of life that is inspirational.